Here are answers to a number of frequently asked questions about the MakerBit. If you don't find the answer you're looking for though, just use the "Contact" tab above to send us your question. Where is the best documentation on the MakerBit Kit itself? The Tutorials tab above leads to the MakerBit Tutorial, which is a Google doc that is frequently updated, and those changes are immediately reflected in the document whenever you open it. Along with that, the various pages here that make up this MakerBit website have a lot of excellent information. Also, you may want to join the MakerBit Community Group on Facebook. It's a great group of talented people sharing ideas, help, and projects. What's the youngest age that can use the MakerBit? By 2nd grade (7 years old), kids are quite capable of using the MakerBit Media Linker to set up the lights and sensors in a project. Adult help is required to demonstrate how to do it once or twice, but once shown, the kids are quite capable of continuing on their own. What's the oldest age that it's still challenging? The MakerBit system is exemplary in its combination of a "low threshold" and "high ceiling". That is to say, one can start very simply, and learn the basic principles of adding lights and interactivity to a physical model. From there, the "teachable moment" is, "And how cool would it be if we added a video to explain that part of the model?". Having done that, there are many more incremental steps for learning everything from block programming and coding, more about interactive electronics, all the way up to robotics and electronic projects and inventions! How many MakerBit kits do I need? To answer this, it's good to think about how many students will be working on interactive maker projects at the same time, and how many total interactive maker projects will be created. The MakerBit Starter Kit has enough to make 2 projects with the LEDs and rainbow cables included in the kit. LEDs, cables and touchpoints can also be reused for projects after that. For an easy first step in setting up a library or other makerspace you may want to consider getting the MakerBit Mini-Makerspace Starter Set, which will give you six MakerBit units, plus enough LEDs, cables and sensors for 18 projects. With students working in pairs, that's sufficient for 36 students for one round of projects. For successive projects, the materials can be reused. For a school makerspace, we recommend the MakerBit Makerspace Set, with 30 MakerBits, and enough materials for 150 projects. All of these are described in more detail in the MakerBit Store. Does the MakerBit need to always be attached to the project? No. You can attach the LED and sensor ends of the rainbow cables to the project, and then just connect/disconnect the other end of the rainbow cables from the MakerBit. Does the MakerBit need to always be connected to the computer? No. The MakerBit Media Linker app allows you to set up the LEDs and sensors and connections between the digital and physical project even when the MakerBit isn't attached. The only difference is that the configuration window displays connections in gray, rather than the real-time feedback from when an active device is attached. Can I re-use the rainbow cables, LEDs and sensors between projects? Yes. Although the idea is to leave the rainbow cables, LEDs and sensors as part of the physical project while the project is being shown and used, you can re-use the cables, LEDs and sensors if you wish. If the LEDS and sensors are held in place with just tape, it's very easy to remove them later. Even if they are glued in place, they are inexpensive to replace, and the rainbow cables are made to easily connect and disconnect from both the LEDs/sensors and the MakerBit itself. Can students work on their digital project without the MakerBit? Yes. The MakerBit Media Linker app allows students to configure LEDs and sensors, even when the MakerBit hardware is not attached. That way they can continue to work on the media list portions of their project when they're at home or otherwise away from the makerspace area. Can students work on their physical project without the MakerBit? Yes. 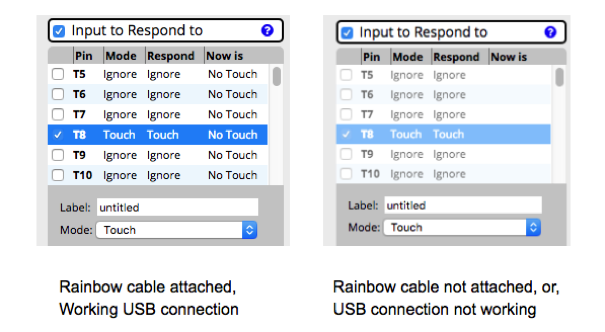 Because the rainbow cables are made to easily connect/disconnect from the MakerBit itself, students can work on the physical project, installing the LEDs and sensors, etc., and then just plug the block connector end of the rainbow cable into the MakerBit when they want to test and/or demonstrate the actual interactivity. Can the MakerBit board be used without the MakerBit Media Linker? Yes. For the interaction between the digital project and the physical project, you'll want to use the MakerBit Media Linker app for the digital project on the computer. However, if you decide to explore running programs called sketches on the micro:bit itself, you can use the micro:bit IDE (Interactive Development Environment) to write and upload your own custom programs to the micro:bit. At that point, you won't need the MakerBit app to control the LEDs or monitor the sensors, however you also won't have the many multimedia options of the MakerBit app to associate with your project. Can the MakerBit be used without a computer? Yes. The MakerBit system can run different programs that run on the BBC micro:bit attached to the MakerBit. In fact, "out of the box" the very first configuration of the MakerBit system is an automatic mode, where no computer is needed for the first part of the tutorial. Can the MakerBit be used with a breadboard and other components? Yes. Totally aside from the use as a bridge between digital content projects and physical interactive maker projects, the MakerBit provides a great starting platform for doing any kind of micro:bit experiment, because it has the resistors and voltage-divider circuits already in place. The MakerBit also still has all of the standard micro:bit I/O and Analog pins available in the standard headers along the edges, so it's super-easy to use jumper wires to connect to your own breadboard and components. Is the MakerBit app still useful for breadboard experiments? Absolutely! Because the MakerBit app replaces the need for written scripted programming, you'll find that you can more efficiently and enjoyably do many "advanced" micro:bit experiments using the MakerBit app as an alternative to the scripted code part of the experiments. Can the MakerBit be used in more advanced maker projects? Yes. See the above questions about the MakerBit and breadboard experiments. Can I buy just rainbow cables, LEDs and sensors separately? Yes. There's the "MakerBit Re-Supply Set 30-pack" that comes with enough supplies for 30 interactive maker projects, with 90 easy-connect rainbow cables, and 390 each (1560 total!) red, green, yellow & blue LEDs, and 750 touchpoints!